Perfect for announcements, directing attendees to your next event, or as a lawn service, landscaping, or political sign; or even to promote your garage sale or business. Our custom yard signs are 18” x 24” and made of durable corrugated plastic that easily installs over ground stakes, fits within framed signs, or looks great hung from the ceiling. Use them indoors or outdoors. 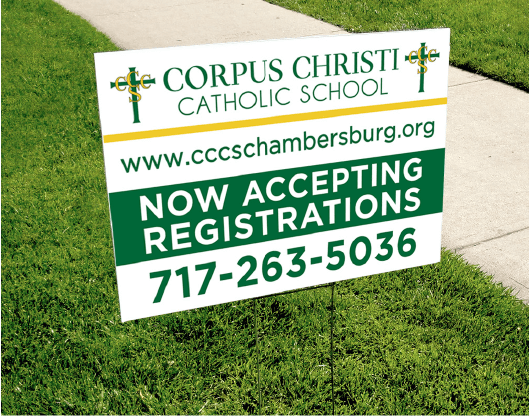 Lawn signs are versatile, affordable and can be printed single or double-sided. Larger sizes are also available.